Roast breadfruit – Learn how to prepare this healthy savoury starch enriched crop in the oven using the double roasted cooking method. I’m so excited because this is my first time showcasing a breadfruit recipe on my website. If you’re from the islands, polynesia or certain parts of Asia then breadfruit isn’t an exclusive commodity for you. With that said, with so many contemporary diets i.e paleo which consume a lot of Carbohydrate enriched foods that originate from the tropics I wouldn’t be surprised if many people had already heard of this wonderful fruit. Firstly, if you’ve never heard of breadfruit you’re probably wondering, what on earth is it? The name alone sounds insane I mean Bread and fruit, is it a sweet fruit or some type of exotic bread? I’m looking at things from the outsiders perception right now and I know if I were clueless I’d be thinking along those lines. Well Breadfruit grows on trees, it’s starched enriched (clean starch) and an emerald green colour in it’s infancy stage with the tendency to take on a darkened hue as it ripens. 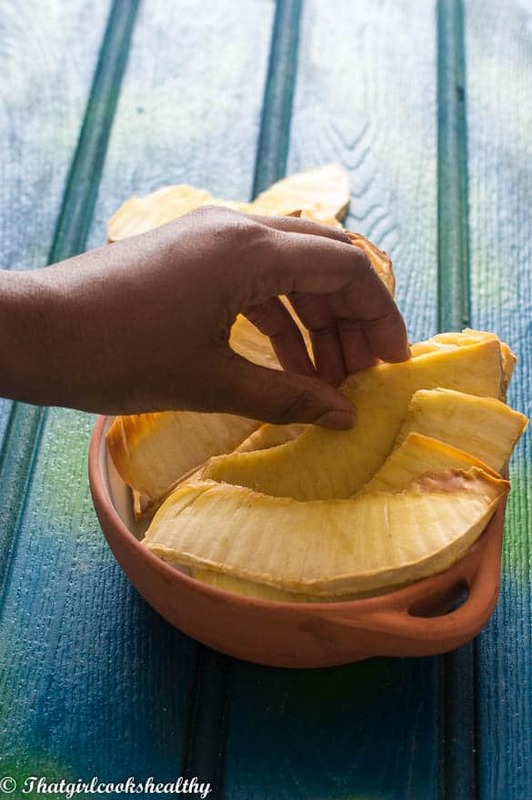 Although breadfruit can be eaten at all stages of development in the Caribbean we tend to eat it matured – when it’s soft to the touch with a subtle hint of sweetness. How does breadfruit taste like? Breadfruit has its own unique taste which is difficult to describe. I would say it’s like a soft potato with a crispy exterior depending on if it’s boiled, roasted/fried. How do you cook breadfruit? It’s a very versatile crop – boil, fry, roast, mash, pickle, you name it and someone has tried it. In my household we would usually roast and then fry it, sometimes MY grandmother would boil it along with ground provisionS (dasheen, yam, potatoes etc..). To this day I enjoy eating breadfruit (roast breadfruit), though it’s not always easy to obtain where I live, thankfully I managed to purchase half a breadfruit to roast at home recently. In the Caribbean, you’ll find the entire breadfruit being roasted on a open fire, that’s just how it’s done on the islands. However, living in the diaspora, things are a little different, for instance on this occasion I foil wrapped the breadfruit (wrapped is only required when roasting half) with a little coconut oil and placed the whole thing directly in the centre of the oven. When roasting a whole breadfruit I would follow the traditions of removing the stalk then mark an X at the bottom. Some people living abroad try to replicate what they did back home by roasting the breadfruit openly on the stove but for safety reasons I will not be endorsing that method. 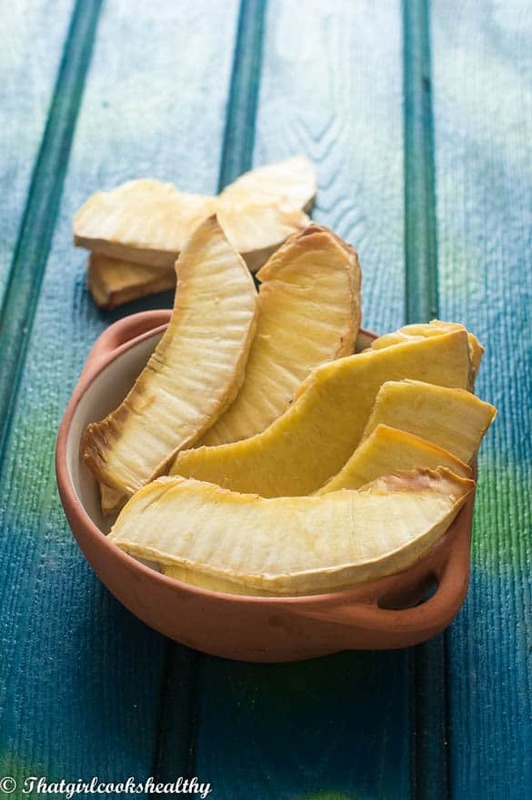 Roasting breadfruit instead of frying it – the healthier way! As previously mentioned I achieve the picture results doing the roasting and frying technique which tasted divine, it yielded a soft yet crunchy taste – great for a side dish or to form part of a meal. Being health conscious I knew frying breadfruit in a large amount of oil wasn’t right nor good for one’s health. Today I do things a little differently I roast the breadfruit (wrap only if roasting half), let it cool, slice the entire thing then coat in oil and roast again in the oven. This may seem bizarre to some but the results are essentially the same as the roast and fry method, only cutting out 2/3 of the oil that’s used – kiss goodbye to deep fat frying. Don’t compromise your heart any longer, get the same results using a very small amount of oil – your cholesterol and blood sugar levels will be thanking you for choosing to cook this way. 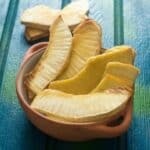 Where can I purchase breadfruit if I don’t live in the Caribbean? 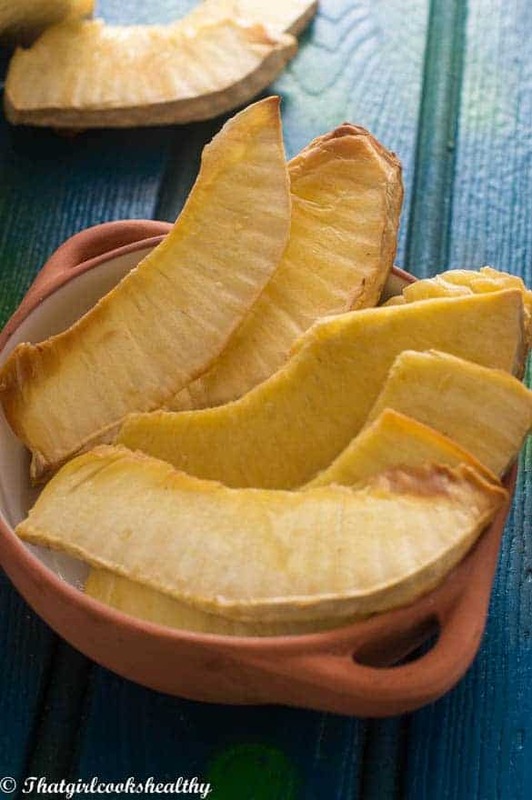 Breadfruit can be purchase from most market or supermarkets in an area where there’s a lot of Caribbean people. Also, Asian groceries tend to sell breadfruit. Breadfruit is very expensive so if it’s your first time buying it, then ask the vendor to slice 1/3 quarter or 1/2 a breadfruit until you work your way up to a whole one. I truly hope you love roast breadfruit as much as I do!! Simple tutorial on how to make roast breadfruit in the oven – paleo, gluten free and vegan. Wash and dry the breadfruit. Rub the entire breadfruit with coconut oil before wrapping it with foil. If roasting a whole breadfruit simply omit this step remove the stalk and score an X with a knife at the bottom. Place the breadfruit accordingly in the middle of the oven to roast. The cooking time will vary depending on the size. Half a breadfruit should take roughly an hour and a whole one should take 1 hr 30 minutes. Once cooked it should be soft and easy to pierce/prick with a knife. Line a baking try with parchment paper then use a pasty brush to coat each slice with coconut oil. Lay each slice on the parchment paper before placing back in oven to roast for a further 15 minutes or until golden brown – don’t forget to turn over half way through. I was pleasantly surprised to see breadfruit in a newly opened supermarket yesterday. know how it turned out. Hi Ceil. I’m happy and yet surprised that you are able to source breadfruit in the UAE. I wish I was able to get some on my trip there but hey maybe next time. Let me know how it turns out as always. Will be in touch again when I’ve tried your recipe. recommended for the second roasting. Regardless, I’m a very happy camper. Hi Ceil. Glad you managed to get hold of some breadfruit. I have noted the additional cooking times, that may vary depending on the type of stove that is used. Good point…I mentioned to several colleagues that baking here takes much longer than it would back in the west and they all shared that they too have this issue with their ovens. Thanks again for all the yummy recipes. Keep well and have a wonderful weekend. I’ll stop by your awesome website again around Easter. You’re most welcome Ceil and looking forward to more feedback over the Easter period. Bf has become a tasty staple on my paleo diet – thanks so much! Hi Sheila, Sorry to hear about the explosion. Glad you were able to still salvage enough to enjoy the benefits.